The trek to Everest Base Camp is without doubt one of the most famous in the world. It takes you into the heart of the Nepalese Himalaya, with awe-inspiring views of many of the world's highest and most beautiful mountains. The name "EVEREST" is magic in itself. Everest ( 8848m. ) 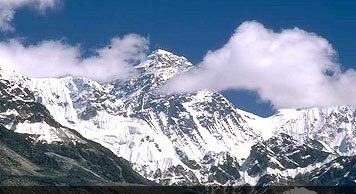 is called "SAGARMATHA" in Nepali – "Higher than the Sky" and "CHHOMOLUNGMA" in Tibetan – "Mother Goddess of the Earth". The quickest and easiest way to reach this region is by flight to Lukla at 2827 m.
The Mount Everest or Solu Khumbu region is the second most popular trekking area in Nepal. It would probably be the most popular destination, but it is more expensive and difficult to get to Solu Khumbu than to the Annapurna area. To get near Everest, you must either walk for a week or fly to Lukla, a remote mountain airstrip. Solu Khumbu is justifiably famous, not only for its proximity to the world's highest mountain (8848m. ), but also for its Sherpa villages and monasteries. The nominal goal of an Everest trek is the Everest base camp at an elevation of about 5340m. You cannot see Everest from the base camp, so most trekkers climb Kala Patthar, a 5545m bump on the southern flank of Pumori (7145m.). From Kala Patthar there is a dramatic view of Everest.